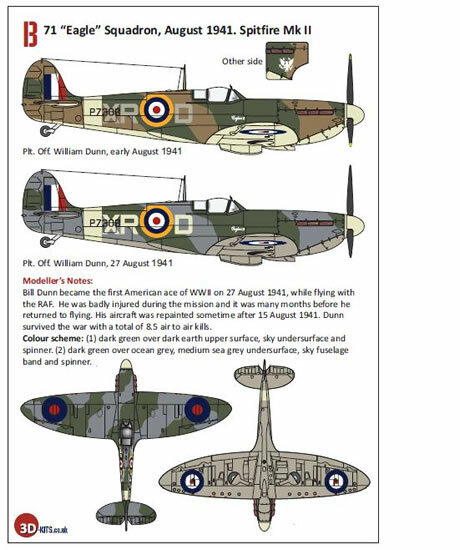 Decals for 4 subjects (with bonus and minor variations), colour-printed painting and markings guide, plus stencil placement guide. None, assuming missing bonus decal was unique to my sample. The Spitfire, one of the most, if not the most beautiful fighter ever is a justifiably popular modelling subject. As such any new decal sheet covering some interesting schemes is sure to be welcomed by many. 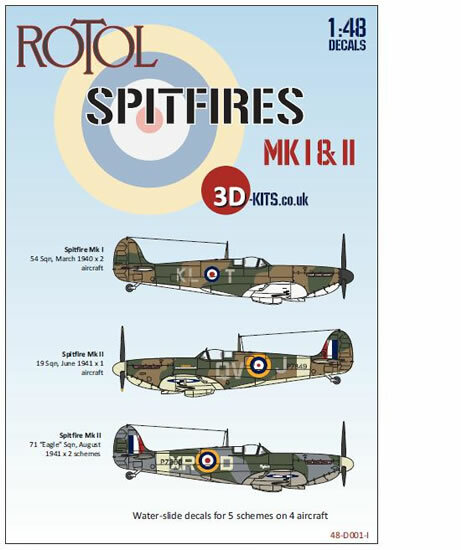 3D-Kits has selected some interesting early Spitfire Schemes with the decal sheet reviewed here. Spitfire Mk I, 54 Sqn, March 1940 (Two aircraft KL*T & KL*O), although no serial numbers provided as apparently they were not visible in photographs. Spitfire Mk II, 71 "Eagle" Sqn, August 1941 (XR*D P7308, flown by Bill Dunn, the first American ace of WW2). 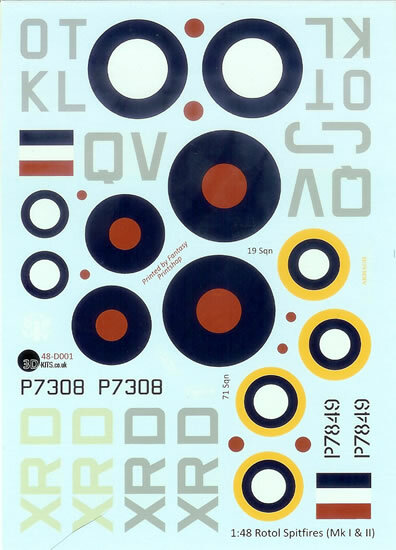 Two painting guides applicable to the same aircraft are provided for early and late in its career, along with the applicable grey and sky codes for each scheme. Click here to open a PDF showing the schme options in large format. The decals are supplied in the ubiquitous A5 zip-lock plastic bag with the folded instructions providing attractive bag-art. 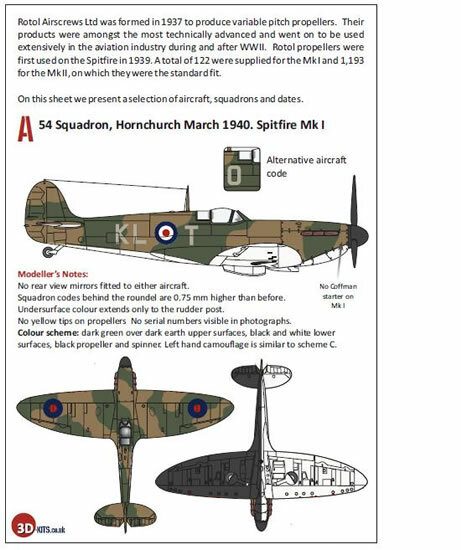 The instructions are nicely produced in colour and clearly indicate markings placement and provide RAF paint names. A brief written description of the paint scheme is given for each subject. The decals themselves look to be superbly printed and with excellent colour density. They are printed by Fantasy Printshop. A Bonus decal option for the 65 Sqn machine option is mentioned, but there was no sign of the squadron codes or serial number mentioned in the instructions. I assume that this would have been on a small piece of backing paper as it’s clearly not part of the main sheet. My sample has passed through at least another set of hands between 3D-Kits and me, so it may have been lost in the process of getting to NZ! 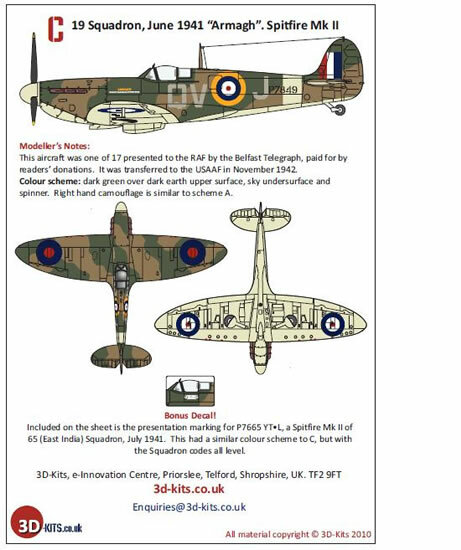 This is a superbly produced set of what in my opinion are some attractive and interesting early Spitfire schemes. Thanks to 3D-Kits for this sample.